When your five year old expresses an interested in learning about Vikings, exactly what are you supposed to do? I poked around and asked a few friends for suggestions but no one had any specific titles to point me towards. My kids are all currently ages 8 and under so I was very interested in finding some titles that weren't all about the blood and the gore. With no suggestions, it became clear I was going to have to take a gamble and see what I could find. When it came to purchasing books about the Vikings I really appreciated Amazon's "Look Inside" feature. It helped me to get a feel for some of the titles, several of which I bypassed as being inappropriate for my children's ages. Some of the titles I share below were purchased on Amazon and some were found by perusing the shelves of our local used bookstores. 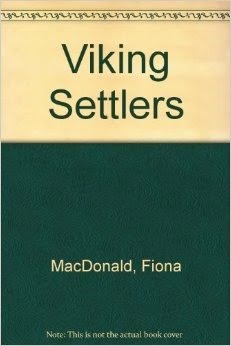 #1 - Viking Settlers, by Fiona MacDonald. Note: This is not a picture of the actual book. I can't find one online (which is a pity). (I might update this post with an actual picture of the copy I found.) This book was published in 1992 and would appear to be out of print, which is a real shame. The cover art is actually nicely done and very appealing. Viking Settlers is fully illustrated by Maggie Downer. Each page spread paints a scene of the Vikings building ships, sailing, building homes and, yes, attacking monasteries. When the Vikings are depicted in battle it shows them hovering over their victims with swords in hand. No blood, but you get the idea. In this book MacDonald covers topics such as Viking homelands, what they ate, how they traveled, and their death and burial practices. The book concludes with a timeline of events for the Vikings which is helpful piecing together their history. I'm a big fan of this book and if you can lay your hands on a copy, do! 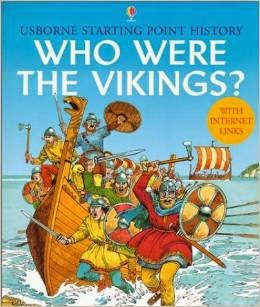 #2 - Who Were the Vikings? , an Usborne Staring Point History. The Vikings look a little bit more, um, threatening than they do in Viking Settlers. Like many of Usborne's history books, it is filled with lots of illustrations and paragraphs of information scattered about the pages. Although the book is ordered out out much like Viking Settlements, it does feel more chaotic given the fact that there's hardly an inch of paper that is not covered with text or illustrations. It's a very busy book! However, it is also useful in providing information. Who Were the Vikings? is also illustrated and, like the above title, there is nothing gruesome contained within. The two books combined helped to solidify what we were learning and, as is usually the case, each book you read on any given topic tends to add another layer of understanding. This book is likely easier to get a hold of and I have no objections to sharing it with small children. 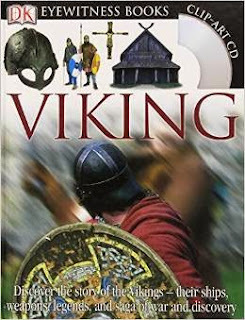 #3 - DK Eyewitness Books: Viking . I liked this book because it contained photographs of Viking relics. We read through our books on Vikings over the course of a week (one book a day, followed by a documentary which I'll share below) and we saved this title for last. At this point, the kids were getting a good picture of who the Vikings were, where they came from and how they lived. It was interesting for all of us to see photographs of Viking swords, cups, pendants, ships, etc. Much like the Usborne book, this DK edition is also full of facts and visuals. However, I found it slightly less distracting of a title due to the photography. It didn't feel like a bunch of doodles filled the pages. The artifacts displayed made you feel more like you were taking in a museum exhibit instead of necessarily reading a book if that makes sense. At the conclusion of this book there are several pages with more detailed information about famous Viking rulers, adventurers, writers and historians, etc. 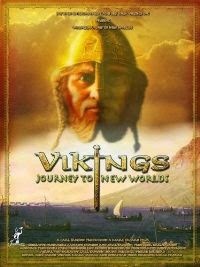 I highly recommend this title to anyone wanting to learn about the Vikings with their younger children. #4 - The Vikings: Facts, Stories, Activities. This title was published by Scholastic in 1991. It also appears to be out of print. The only slightly creepy illustrations in this book are the faces of the Viking gods. Otherwise everything and everyone looks pretty normal. I like the layout of this book (although it does feature the same busy format as the titles already mentioned) in that the paragraphs of information seem decently spread from the illustrations. This title includes a story about the Viking gods ("Thor Visits the Land of the Giants") which is included in the famous Sagas. Scattered throughout the book are a couple of ideas for some Viking crafts that you can do if you so choose. 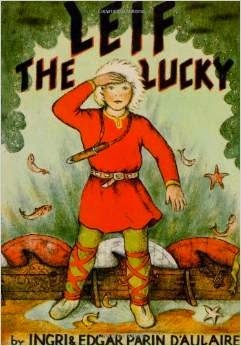 #5 - Leif the Lucky by Ingri and Edgar Daulaire. This tells the story of famous Viking explorer, Leif the Lucky, who set sail from his home and family in Greenland and discovered North America. Actually it was Leif, not Christopher Columbus, who was the first European who set foot on North America. I'm not sure what that does about our Columbus Day but it's good to know the facts. This title is delightfully illustrated and all of my children enjoyed hearing Leif's tale. This documentary focuses primarily on the Viking expansion in the west. It discusses their move to Iceland and Erik the Red's temporary banishment which led to him exploring Greenland. From there Erik the Red's son Leif set out to discover new lands which, of course, led him to North America. This film does reference the fact that the Vikings were known to be fierce warriors (it opens with the attack on Lindisfarne) but it stresses the point that many Vikings were farmers and explorers. Although this film does show the attack on Lindisfarne, it simply shows the Vikings approaching the monks and then the screen quickly blacks out. Next a video of a Viking slashing his sword appears on the screen and then also instantly fades to black again. There is no visual of anyone being attacked and nothing frightening appears on the screen. The only other tense moment is when the Inuit Indians are approaching the Viking camp (North America) to kill the explorers. Bookworm1 was starting to feel a little anxious as the Viking tent was surrounded, but I assured him that nothing scary would be seen and that settled him. I really appreciated the fact that someone bothered to make a fairly informative documentary on the Vikings without delving into battle, death and gore. Yes, of course, we will learn more about this side of the Vikings as the children age but below the age of eight I truly don't think it's necessary to dwell on such subjects. You can know that the Vikings were warriors but you don't need to witness a killing to fully comprehend. This documentary suited our needs perfectly and I'd recommend it to parents looking for resources. However, I'd issue the caveat that when it comes to learning about the Vikings, any resource you decide to pick up really needs to be previewed by the parent before showing it to the kids. One note of complaint: I don't know who produced this documentary but a man with a North American accent provides the commentary. He did not know how to correctly pronounce Richard Wagner's last name, nor the word "saga" which drove me nuts. It seems to me that they could have educated themselves as to correct pronunciation. I don't know why they didn't. All in all, I've been happy with the above titles and if this helps another person to find books that they feel comfortable with then it's all good. Of course, I'm interested in learning about more materials and resources on the Vikings. If anyone out there has a suggestion to make, I'm all ears! Oooh, THANKS! I bought a book of Norse myths but we haven't started in on it yet. I don't have any objections or hesitations about reading myths and legends from other peoples in other lands. Reading about the various gods does not cause me hesitation. Rather, I find them to be good conversation starters and I believe they give us a healthier perspective of history and our own worldview and how it influences our lives. I will definitely look up the two titles you've suggested. Have you read any of the Adventures in Odyssey Imagination Station books? #1 in the series is called "Voyage with the Viking" and is about Erik the Red and Leif himself! We talked a bit about Vikings last year, but didn't go into near as much study as y'all. I'm going to have to bookmark this post for when that time comes!